Is it just me, or did today feel more like Friday than Wednesday? Hello, 4-day-weekend, am I glad to see you! I’m totally not complaining. Wanna see some WIPs? 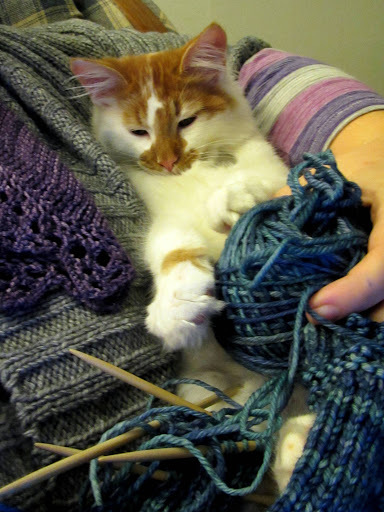 That is a terrible photo of the knitting but an adorable photo of Darwin, so I kept it. Thanks to an extra-long conference call today, I finished one of the pair of my Beribboned Wrists and started the second. These are my leave-at-work knit because they are simple and I can just knit a row here and there when I have a second without messing anything up. I anticipate having a pair of these on the needles continuously for a while, people have been chatting them up on facebook and I’m being convinced to open an Etsy shop and sell them… but probably not until after the new year. Too many deadlines! In addition to the secret knitting I ‘showed’ you last time, I have another secret design on the needles using yarn from Dragonfly Fibers. 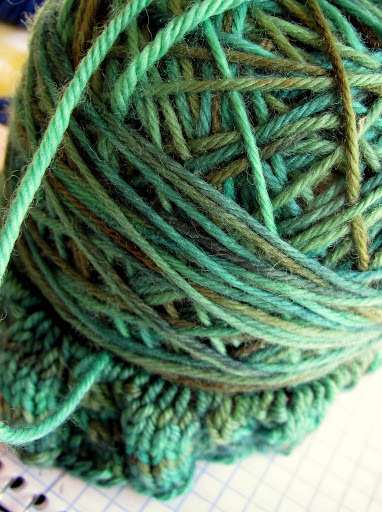 Kate uses similar yarn bases as The Verdant Gryphon and Cephalopod Yarns and is another Maryland-based indie dyer. I don’t know what they put in the water down in Maryland but it sure makes for some talented and creative fiber artists with great color sense, and I’m grateful for it! This was a total impulse project. I saw the post about the mystery KAL, knew that I liked Star’s sock design I’d recently knit, had been thinking about making myself a new cowl, and once I heard the word “discount” (10% off the yarn with purchase of the pattern) I jumped at the chance to justify trying this new-to-me bulky yarn: De-Vine from Blue Moon Fiber Arts. 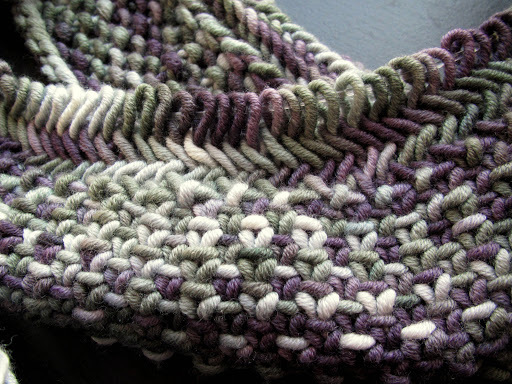 The yarn is crazy cool and different from anything I’ve knit with before. How crazy is that, right? It has a dense, almost velvety texture. It’s really nice. And the pattern is simple and fun so far. It involvs linen stitch and herringbone stitch, both of which are pretty rough on the hands (especially on size 15 needles!) 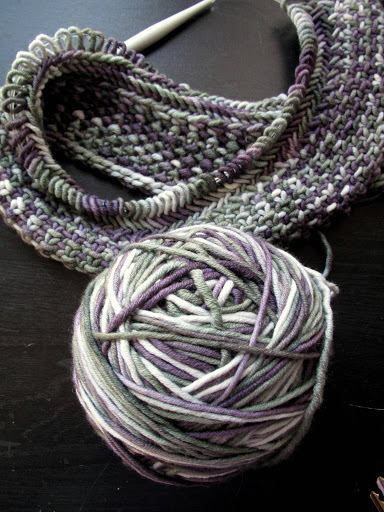 but work so well with the variegated colorways of Blue Moon that it’s worth it. You can read more about the KAL in Star’s Ravelry group. That’s most of the knitting I’m actively working on right now. 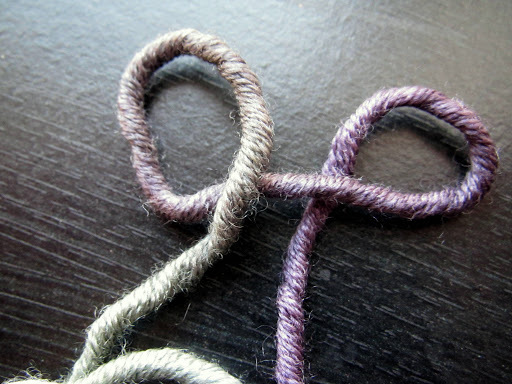 I’m looking forward to some seriously focused knitting-and-blog-reading time this weekend, I feel so behind! I normally travel to Long Island for the holiday but the Fiasco and I are staying in CT this year. We’ll spend Thanksgiving with his family and then spend the rest of the weekend packing our apartment up because we’ll be moving to RI the following weekend! It’s not a very far move but it is an exciting one because it means we 1) gain about 400 square feet of space (yaaaaaay) and 2) lose 45 minutes off my current commute (double yaaaaay). While I’ll miss seeing my family very much, it will be good to get ahead on things around here. I hope you all have a good holiday! 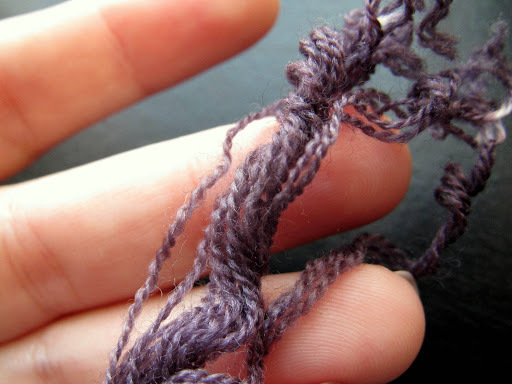 This entry was posted in BlueMoon, KAL, kitty, Malabrigo, WIPWed by shoelaceswitcher. Bookmark the permalink. Whew, sounds like you have a busy couple of weeks coming up, good luck with the move! I definitely think that you could sell your knits, especially since you have a good eye for color and design. Also you have the most difficult part out of the way, designing the things you can sell! Happy Thanksgiving! Wow, that is a lot of knitting! Good luck in the next few weeks. I am in love with your cowl!! IN LOVE! That yarn looks simply devine. And as for selling? Well only if you think people will buy what you make at the price you'll have to put it at 🙂 Your stuff is worth a lot (to me!). Happy Thanksgiving! Thank you! 🙂 Hope you had a great thanksgiving. haha thank you, Lisa! Hope you had a great thanksgiving, too.